Fate of the accounts in the two banks that went under remains unresolved. The fate of Laiki depositors is more or less clear as there will be practically nothing left from money above 100 000 EUR. 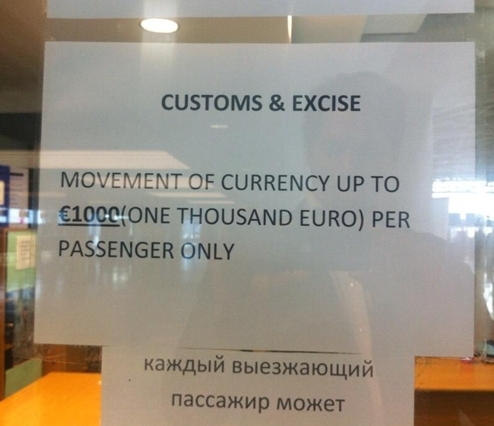 But there is no cheer for depositors in Bank of Cyprus either. Although the early estimates predicted losses around 20%, reality turned out to be worse. A lot worse indeed, as more than a third of each deposit will be transformed into (almost worthless) shares of the bank, the rest will be frozen for long years to come. Real loss of withdrawable cash thus approaches 100% in reality. Accusations are getting serious as well. President Anastiasiades has been so far angrily warding off accusations which claim that his family transferred money from Cypriot banks literally seconds before their fall. Finance minister Sarris resigned after only few weeks in office due to the storm of charges upon his head. As ex-boss of Laiki (yes, the bankrupt bank), he allegedly waived debt of many companies connected to the Cypriot political parties. Politicians are not to be trusted. Nor are the central bankers. Or would otherwise trustworthy people reassure depositors and general public that everything is just fine to the very last moment? If not a lie, only stupidity comes to one’s mind. You pick what’s worse. The freshly resigned French budget (ex)minister Jerome Cahuzac also experienced an unfortunate inconvenience. One of the main verbal champions against the tax heavens and propagator of Hollande’s 75% tax was accused of hiding 600 000 EUR in a Swiss bank account. He tried to talk round out of the mess but ultimately he broke. „I was caught in a spiral of lies and lost my way. I am devastated by guilt,“ he said. The abovementioned 75% tax is in the meantime threating to destroy France’s Football League, as most of the top star players became too expensive for the clubs. Already year ago the president of the league warned that the tax will cause flight of top players to other countries and that the 1998 World Champion will turn into a country, where only the second-class football is played, comparable to “countries like Slovenia or similar”. But let’s not be harsh on French all the time. After increasing or creating a whole new chunk of taxes, the only reaction was increased unemployment and worsened budget deficit. Hollande’s administration therefore prepared also a cautious package of pro-market measures. It contains relaxing of conditions for granting the building permits, accelerated payments to the state suppliers or decrease in the count of budget-funded entities. There is also one interesting rule saying that any introduction of a new regulation is to be complemented by cancelation of some regulation already in place. Greece got into the shade of its insular cousin for a moment. But they don’t sleep. The merging process of National Bank and Eurobank into a gigantic banking Moloch continues. Instead of liquidating the bad parts and keeping the good ones, they are trying to join the clumsy and the badger-legged in a hope that the result will be able to walk straight. Does it remind you of something? You are right if your answer is Spain. This is exactly what Spaniards did when they merged the failing banks (also known as “cajas”) into one giant and named it Bankia. This guy merely survived two years and his shareholders can only cry now, as they already lost 96% of their investment. Under the term “shareholders” you have to imagine 350 000 ordinary citizens who got lured by the governmental sweet talks. Several of them suffer from Alzheimer’s disease and some of the even weren’t able to sign themselves. Who’s the next for the haircut then? Slovenia? The bad debt ratio in the largest banks reaches 15-20% and because they are state owned, they don’t have any foreign mothers which would recapitalize them. Government claims that they will manage the issue without foreign help. 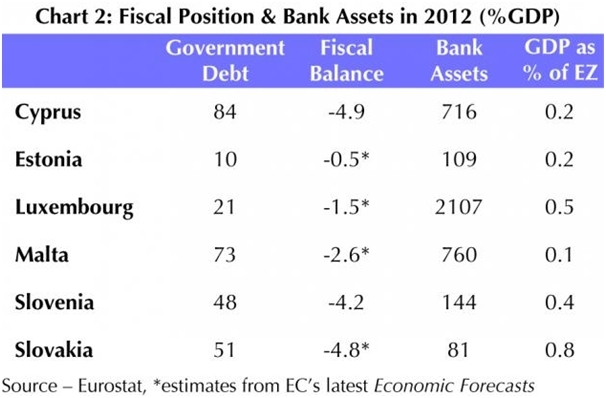 Let’s wait how they will do in few months, when part of the Slovenian debt becomes due. Malta? 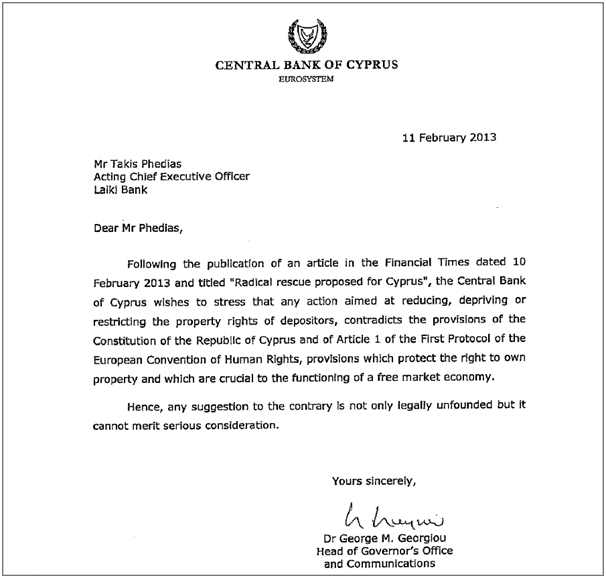 The local banking system is equally inflated as the Cypriot one, but they allegedly did not invest as poorly as Cypriots. Luxemburg? 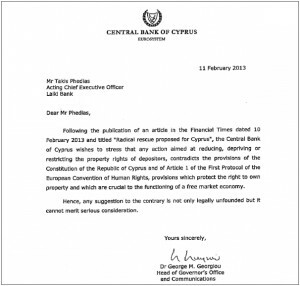 The size of its banking system is 2100% GDP, three times the Cypriot’s figure, but most of the banks are foreign. In short, everybody has his own excuse and assures the investors that he is to be trusted. The great ones also have their problems. 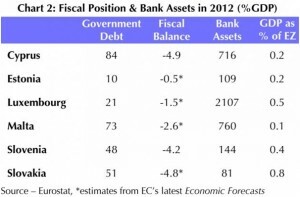 Couple weeks ago rumours circulated, that one of the key European banks hid loss of 12 billion USD to avoid bailout. The rumours suddenly became more serious, when Bundesbank launched probe on Deutche Bank in this issue. Last week we mentioned that European Commission is asking additional 11.2 billion EUR from citizens to fund its programmes. Apparently, not only the traditionally oppositional Britain is upset now, also Dutch are. Their finance minister Jeroen Dijsselbloem said that EU institutions should find the money via saving somewhere else. Well, not everybody gets excited about European programmes.